Hebe ‘Pewter Dome’ forms a tight dome of grey-green, evergreen foliage, 24 in (60 cm) or more high. The leaves are 0.8 in (2 cm) long, and resemble those of Hebe albicans, but are smaller. The white flowers are borne in short spikes, June and July. A hebe hardy in the UK. This hebe cultivar is a first rate shrub, growing and flowering well in sun or semi-shade. 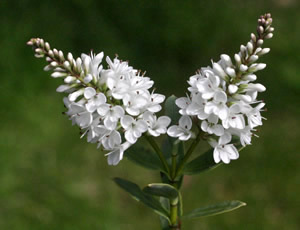 It was raised at Jackman’s Nursery, Woking, Surrey, before 1972, and may be a hybrid of Hebe albicans.